Davidson, NC The weather looks great this weekend. 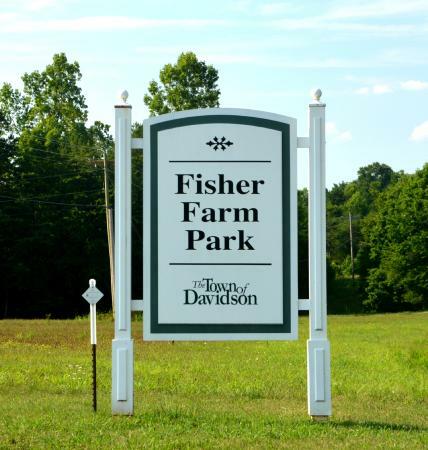 We checked out the newly re-opened Fisher Farm Park yesterday and enjoyed the new paved paths. Great for biking or walking, the new trails are similar to the Greenway. This weekend get outside and enjoy our great Davidson parks. See you around town. If you have other events in town we should note please reach out to us. Thanks! Following a final walk-through, work on the construction of the greenway at Fisher Farm comes to substantial completion today, Tuesday, August 15. This project is part of the Mecklenburg County Park and Recreation Master Plan. Fisher Farm is now open for users to enjoy, but we ask that you please remain on the paved greenway and the mountain bike trail areas. Due to recent heavy rains, the contractor will be coming back to complete hydro-seeding in some areas and some other items noted during the walk-through. Simultaneously, Mecklenburg County will be closing both entry gates to Abersham Park in order to begin that phase of their greenway project. The Abersham paved path will be repaired and widened to meet county standards along the full length of the greenway. In addition, significant road repairs throughout the park will be performed as part of the project and a small picnic shelter will be installed for park users to enjoy. We currently anticipate the entire project being completed no later than December 31, 2017. For more information on this park project, go to http://www.ci.davidson.nc.us/1074/AbershamAllison-Park or contact the North Mecklenburg Region Office at Northparkregion@mecklenburgcountync.gov or 980-314-1001.